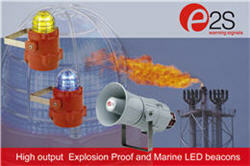 E2S's EEx d versions of its BEx family of Explosion Proof beacons and MB Series of Marine beacons are available in high intensity LEDs rather than the traditional Xenon tube, a change that enables nine different modes of operation to be specified. With versions using both technologies now available, users can specify the best option for the installation. The BEx versions are approved to IECEx, InMetro and GOST R. The devices provide three remotely selectable visual alarm stages. In addition to the stand-alone beacon, the units are available combined with a 112dB(A) sounder in a single housing, giving users a cost-effective and easy to install method of providing both audible and visual signalling.